Doors are subject to a lot of wear, especially if they are used by a large number of people – as is the case in any commercial building. Accidents and adverse weather conditions may also affect them and cause them to break down. 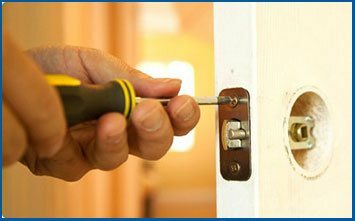 If your existing commercial door(s) are giving you trouble, you can hire North Easton Locksmith fordoor repair. We are a professional commercial locksmith service in North Easton, MA, an area we’ve been active in for a decade. We’ll get your door repaired in a short span of time, no matter the type of the door. Our experts have a great deal of experience with door repairs and we have a well-stocked inventory of replacement parts. What type of doors can we repair? Apart from regular and entry doors, we can also repair garage doors. Do you have a unique type that isn’t very common and its parts are hard to find? Don’t worry - our technical engineers will fit new ones for you. We have a very well-stocked inventory of parts. Repairing popular door types is effortless for us. We always attempt same-day repairs, in an attempt to save you as much time as possible. If your door is beyond repair, our door repair experts will replace it for you (including garage doors), if you require us to. Our door repair experts are on call 24/7 – all week, all year, even on major holidays. When you contact us and explain your requirements, we’ll send a team to your location immediately. It doesn’t take us more than 30 minutes, most of the times, to get to destinations in North Easton and beyond. Our vans carry our inventory, so we can provide you with a fast on-site service. Your door repairs will be handled by experienced professionals. Our locksmiths receive a great deal of practical training and instruction, and we also provide them with all the latest tools which allow them to fix all door types easily. Get in touch with us on 508-217-3332 !